14 Year Old Retriever Mix not feeling well, acting weird, not eating, and having trouble walking. Patient is a 14 yr old, MN, retriever mix that presented for a brain CT due to recent onset of lethargy, ataxia, not eating well and abnormal behavior. In addition, a CT scan of the abdomen was requested due to an adrenal tumor found on ultrasound. Abdominal ultrasound revealed an enlarged right adrenal gland of mixed echogenicity, solid in appearance, irregular in shape but with no evidence of mineralization. Patient was anesthetized and a pre contrast CT scan of the skull and abdomen was performed. Afterwards, Omnipaque ™ (contrast agent) was administered IV and post-contrast studies of the skull and abdomen (both arterial and venous phases) were acquired. 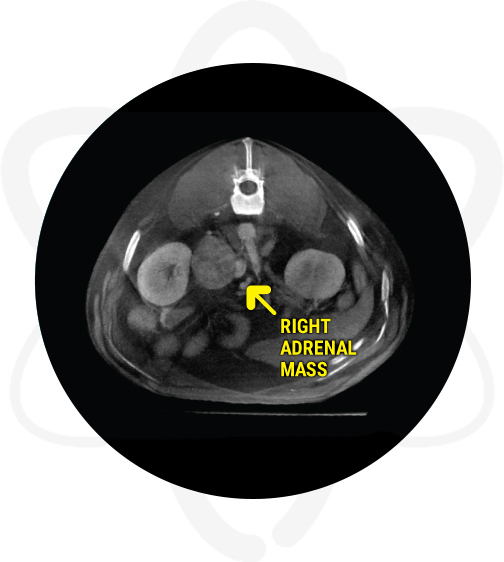 A large aggressive right adrenal mass invading the caudal vena cava and displacing the right kidney and renal vessels was noted on abdominal scan. The mass likely represents a neoplastic process such as adrenocortical carcinoma or pheochromocytoma vs neuroendocrine neoplasia. The slim left adrenal may be secondary to some degree of atrophy. No other evidence of metastasis was noted. In addition, there were portal vein filling defects which can be secondary to small thrombi or secondary to streamlining (artifact of flow). No abnormal findings were noted in the brain on the skull CT scan. However, a polypoid right laryngopharyngeal tissue and a left tonsillar bulge were noted. 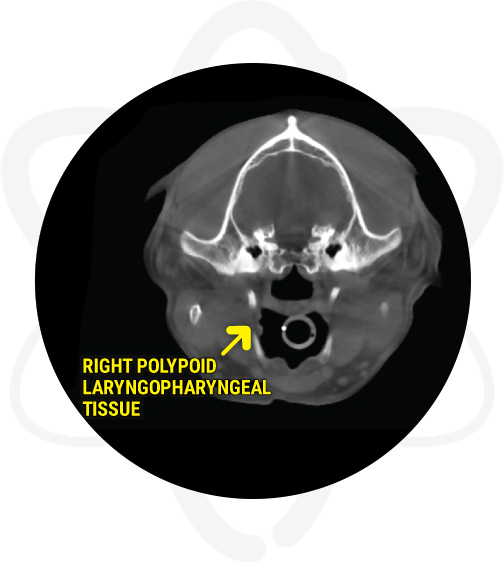 The polypoid laryngopharyngeal tissue can be originating from the right tonsil or the laryngopharyngeal mucosa and can represent hyperplastic or inflammatory tissue vs an early neoplastic process. In regards to the tonsillar bulge, the main rule outs are inflammatory or reactive changes vs early neoplasia. The owner is considering therapeutic options for the adrenal mass. In regards to the neurological abnormalities, a consultation with a neurologist was recommended. Provided crucial information such as invasion into vena cava and displacement of right renal vessels regarding the previously known adrenal gland abnormalities. When suspecting hyperadrenocorticism, performing a CT scan of the abdomen provides valuable information to help differentiate PDH vs ADH. 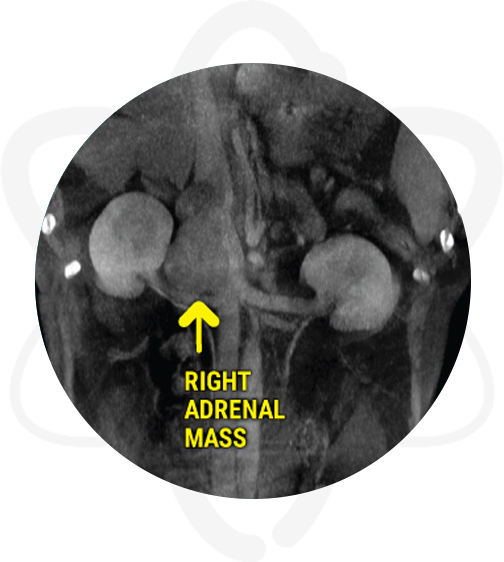 In cases of adrenal masses (ADH), the HD CT scan enables the clinician to have important information regarding the size of the mass, adjacent vascularity, resectability potential, and staging. Furthermore, thoracic CT is also recommended to screen the pet for metastatic disease. Similarly, in cases of PDH, in addition to the abdominal CT, performing a head CT during the same procedure will allow evaluation of the pituitary gland to screen for macroadenomas.